Come to a LAMQG meeting! The Los Angeles Modern Quilt Guild meets at Sew Together on the second Monday of every month from 7:30pm - 9:30pm. The next meeting is this Monday, February 12. The doors opens at 6:30pm. Come and check out the LAMQG. Are you going to QuiltCon? Is your Quilting BFF flying in and out of LAX? We are 2 miles from LAX and in close proximity to the 405 Fwy and the Famous Randy's Donuts. Come by the store to say hello and pick up any needed QuiltCon supplies. We are offering a 15% discount to QuiltCon attendees. Show us your QuiltCon App or Badge from Saturday, February 17th through Wednesday February 28th to receive your discount. Curious about quilting? Come on down! Currently, we have the ongoing Kona Designer Block of the Month Classes. 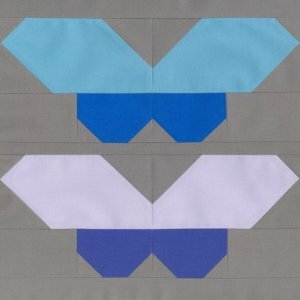 February's Block is Elizabeth's Moth by Elizabeth Hartman. This block is a great introduction to her amazing menagerie that includes sleepy sloths, llamas, flamingos and many more critters. Come and make a moth or pick up the kit to make at home. Quilts tell a story of time and place. They serve a practical purpose of providing warmth and comfort, but they contain much more meaning. Dedicated time and love are sewn into a quilt for the person it is made for and the occasion it marks. The pattern and fabrics are carefully chosen and often reflect a personal connection, a part of the story, of the relationship between the quilter and the special person for whom the quilt is made. Beyond the personal connection to each quilt, there is the creative connection. As makers we love to explore and exercise our creative muscles. We love to play with color or its absence, cut up fabric and reassemble it, and then see what new patterns and shapes emerge from that exploration. Quilts are art, craft, practical, history, story and love. That is why we quilt. Come in and find your own meaning, reasons, and story in quiltmaking. If you are ready to release your inner quilter we have classes for you. For March and April, we are developing new quilt focussed classes. March classes will focus on quilt techniques, like Half Square Triangles, foundation paper piecing, log cabin blocks, and circles. These classes will have you exploring foundational techniques and prepping you to make all kinds of quilts. One of the hottest trends in quilting right now are medallion quilts. For April, the quilting classes will explore how to make a medallion and different borders, using the techniques from the March classes. On Saturday, April 7 we will have a special event celebrating friendship and quilts with Debra Crain. Debra Crain is an gifted teacher and she will be sharing her knowledge as a long time quilter. More details to come about this special event. Save the date: Saturday, April 7. Bring a friend. Come by the LAMQG meeting on Monday, February 12 or Monday, March 12. The store opens at 6:30pm and the meeting starts at 7:30pm. Get your QuiltCon class supplies. QuiltCon attendees get a 15% discount from Feb. 17 - 28 by showing your QuiltCon app or badge. See you at QuiltCon!